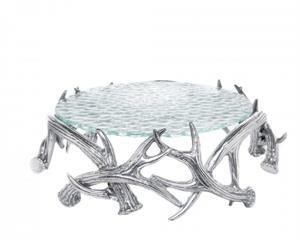 Create a unique, natural atmosphere for your special occasion with Arthur Court's Round Antler Cake Pedestal. Intertwined antlers surround the removable glass to give the base a handsome, woodland feel that blends nicely with the clear top. Handcrafted in sand-cast aluminum, the pedestal lifelike detail in its defined lines and features. Size: Diameter: 13.25" / Height: 5.0"